August 5, 2018 marks the one year anniversary of Ernst Zündel’s passing. He was essentially kidnapped from the U.S. and forced to remain in Germany. His wife, Ingrid Rimland, was unable to leave the U.S. to be with him. She risked jail time in Germany despite having no previous criminal convictions. For the first time ever, “Holocaust” survivors and “Holocaust” historians were closely and critically questioned under oath about their claims and views. Few Canadians realize that Zündel did them “a favor by wiping off the books [the] disgraceful False News laws” strangling free-speech. An adapted extract from Revisionists. com. Ernst Zündel (1939-2017) was a German-born publisher, author and civil rights activist, who emigrated to Canada at the age of 19. He became a successful graphic artist, with his work appearing, for example, on the front cover of Canada’s national news magazine, Maclean’s. Setting aside his thriving career, he dedicated himself to the great task, as he saw it, of redeeming the sullied reputation of his fellow Germans. For seven years he was held behind bars, first in Canada and then in Germany, solely for the peaceful expression of non-conformist views. For some time he was the most prominent political prisoner in the western world. Zündel was an outgoing, good-humored man who was blessed with a rare combination of unflagging optimism and practical ability. He was perhaps best known as the defiant defendant in the much-publicized “Holocaust Trials” of 1985 and 1988. He was brought to court in Toronto on a charge of “publishing false news,” and specifically for publishing a reprint edition of a booklet entitled Did Six Million Really Die? Zündel’s two lengthy trials were something close to full scale debates on the Holocaust issue. To wage the legal battle that was forced upon him, he brought together an impressive international team of researchers, legal specialists, scholars, and many others. From numerous libraries and archives in North America and Europe, this group assembled at the “Zündelhaus” in Toronto one of the most extensive collections of evidence anywhere on this chapter of history. Among those who testified on Zündel’s behalf in the trials were Robert Faurisson, David Irving, Mark Weber, William Lindsey, Udo Walendy, and Bradley Smith. As a result of the two trials, an enormous quantity of evidence and testimony challenging the prevailing Holocaust narrative was presented to the court and thereby was made part of the permanent public record. Perhaps the most important evidence was the historic testimony of American gas chamber expert Fred Leuchter concerning his on-site forensic examination of the alleged extermination gas chambers in Poland. Zündel was found guilty in the 1985 trial, but the verdict was set aside by the provincial appeals court. It ruled that the judge in that trial had, among other things, given improper instructions to the jury, and had improperly excluded defense evidence. At the conclusion of the second Zündel trial in May 1988, a jury declared him guilty. A few days later, he was sentenced to nine months imprisonment. On appeal, Canada’s Supreme Court threw out the 1988 conviction, declaring on August 27, 1992, that the archaic “false news” law under which Zündel had been tried and convicted was a violation of the country’s Charter of Rights. This was more than a personal vindication by Canada’s highest court; Ernst Zündel secured an important victory for the rights of all Canadians. His next great legal battle was fought before the Canadian Human Rights Tribunal [which operates outside of normal legal standards] in Toronto. The charges, instigated by Jewish groups, accused Zündel of promoting “hatred or contempt” against Jews through the “Zündelsite” website operated by Ingrid Rimland from the United States. In this legal action, as the Tribunal’s presiding Commissioner declared, the truth or validity of the supposedly “hateful” items was not a consideration. (Ultimately the Tribunal declared the “Zündelsite” to be unlawful, but because it is based in the U.S., the ruling has been unenforceable). During the 42 years he lived in Canada (1958-2000), Ernst Zündel was never convicted of a crime. He was, however, repeatedly a victim of violence and hate. He survived three assassination attempts, including by arson and pipe bomb. Even Irv Rubin, the American Jewish Defence League leader was caught breaking into Zündel’s home with a member of the “Jewish Armed Resistance Movement” who had previously claimed responsibility for one of the arson attacks. He also endured years of legal harassment and repeated imprisonment. After more than four decades in Canada, including a failed effort to acquire Canadian citizenship, Zündel moved to the United States. On February 5, 2003, Ernst Zündel was arrested at home in the mountain region of eastern Tennessee. U.S. authorities seized him on the pretext that he had violated immigration regulations, or had missed an interview date with U.S. immigration authorities, even though he had entered the U.S. legally, was married to Ingrid Rimland, an American citizen, had no criminal record, and was acting diligently, and in full accord with the law, to secure status as a permanent legal resident. After being held for two weeks, he was deported to Canada. For two years -- from mid-February 2003 to March 1, 2005 -- he was held in solitary confinement in the Toronto West Detention Centre as a supposed threat to national security. His arrest and detention generated wide media attention. A few Canadian newspapers and several independent analysts acknowledged the injustice of his incarceration. The country’s most prestigious daily, the Toronto Globe and Mail, affirmed in an editorial (“Zündel doesn’t warrant a security certificate,” March 6, 2004) that he posed no risk to people or property, and that he was being held unjustly on a bogus “guilt by association” pretext. “ ... Zündel - who did this country a favor by wiping off the books our disgraceful False News laws - has never once been convicted of a criminal offense in this country, never once found to have violated the hate crime laws that rest snugly around the throat of free expression in this country. “Calculating correctly that there was no political cost, no ‘down side’ to slipping on the jackboots to kick a reviled old man out of our country, our government cobbled together their best insults and innuendo, and Lord knows what secret ‘evidence,’ and branded Ernst Zündel a threat to national security. 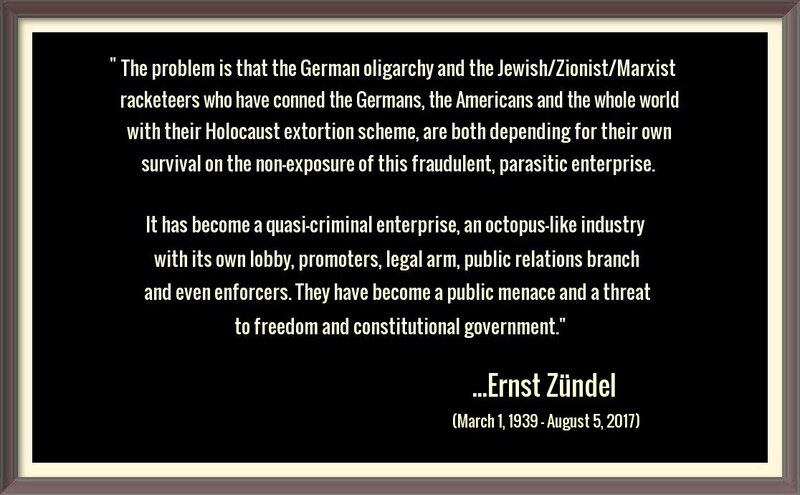 Zündel was held in Canada not because his views are unpopular, or because he was a “security risk.” He was in prison because Jewish groups wanted him there, and because he promoted views that the Jewish-Zionist lobby considers harmful to its interests. This lobby was the decisive, critical factor in the decades-old campaign to silence him. The only sustained and institutionalized effort in Canada to imprison Zündel came from this lobby, which includes the Simon Wiesenthal Center, the Canadian Jewish Congress, the Canadian Holocaust Remembrance Association, and the League for Human Rights of B’nai B’rith (Canada's counterpart to the U.S.-based “Anti-Defamation League”). A few months later the public prosecutor in Mannheim formally charged Zündel with inciting “hatred” by having written or distributed texts that “approve, deny or play down” genocidal actions carried out by Germany’s wartime regime, and which “denigrate the memory of the [Jewish] dead.” .... The 14 specific violations cited by the court included postings on the U.S.-based “Zündelsite” website. The court thus upheld efforts by German authorities to punish individuals for writings that are legal in the country where they are published. Jewish groups quickly, and predictably, expressed approval of the verdict. Zündel was released from prison on March 1, 2010 -- five years after his deportation to Germany, and three years after his conviction by a court in Mannheim. Banned from returning to either Canada or the U.S., he went to his family home in Germany’s Black Forest region, where he resided until his death. Unable to leave the U.S. and be with him, his wife Ingrid Rimland died two months later. The persecution continues. Top: Ursula Haverbeck jailed in Germany at the age of 89. Bottom: Canadian Monika Schaefer held in a German prison six months without trial. She and her brother Alfred are now engaged in a trial so bizarre she had to be escorted from the court room in handcuffs because Alfred defied the judge and took a sip of water. I was surprised when I saw the Mike Walsh article that Ernst Zündel had died. Ernst had been the leader in so many battles for so long and was such a dedicated and determined person that I expected him to go on forever and ever. In this two-part video, Vincent Reynouard pays tribute to Ernst Zündel, who died on 5 August. After briefly summarizing his life, he recounts his revisionist career begun in 1978 with a public protest against the spread of the "Holocaust" series. Ernest Zundel tells the story of how he gets to meet David Cole and how they agreed to meet and explore together the Auschwitz museum. Ernst Zündel died of heart failure on August 5 at his ancestral home in the Black Forest region of southwestern Germany. He was 78. Here is Michael A. Hoffman's eulogy. Ernst Zündel: Unbowed (35:16)... A personal Telling Films tribute by Lady Michèle Renouf to German-Canadian artist, publisher and dedicated campaigner for historical truth Ernst Zündel, born 23rd April 1939, died 5th August 2017 at his ancestral home in southern Germany. Uniquely interviewed as he was released from Mannheim Prison in 2010 and during his journey back to his childhood home in the Black Forest, and updated in this unexpurgated version after Ernst Zündel's death, this film documents his decades of legal struggle for source-critical justice in Canada and Germany, literally illustrated by Ernst's own art works created during his years of imprisonment, and includes an interview with his lawyer Dr. Herbert Schaller. He gave his life so everyone could be free.